KISS’ “End of the Road Tour,” reviewed Monday at Spokane Veterans Memorial Arena. 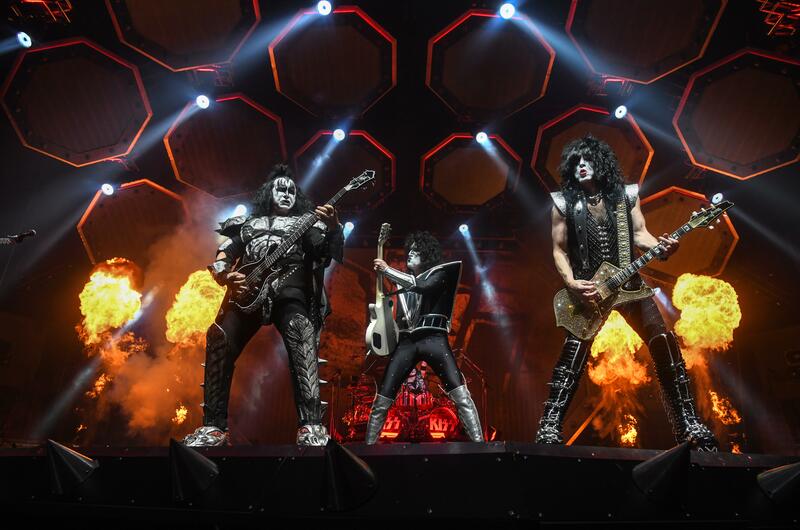 Lights, lasers, floating drum kits, pyrotechnics, fire breathing, blood spitting, guitar smashing and a whole lot of fan appreciation: KISS’s farewell to Spokane will not soon be forgotten. Show opener David Garibaldi kicked off the evening with a little performance art, painting three full-sized portraits in the space of 15 minutes. The mesmerized crowd watched as Garibaldi carved the faces of several rock icons out of a central black canvas, ostensibly conducting the backup music with an assortment of paint brushes. It took some time for Freddie Mercury and Jimi Hendrix to recognizably materialize. But as soon as Garibaldi slashed the beginnings of Eric Singer’s “Catman” into the last canvas, it was clear what would follow; Gene Simmons’ “Demon,” Paul Stanley’s “Starchild” and Tommy Thayer’s “Spaceman” quickly joined before Garibaldi tore a section of fabric from the bottom of the canvas revealing “SPOKANE” in bold white KISS lettering. The small tribute attached to this new piece of “KISStory” was loudly appreciated. A massive black banner emblazoned with the KISS insignia covered the stage. The Arena crackled with anticipation as cheers broke out at every hint of activity behind the curtain. Sinister rumblings and ethereal, red lights filled the arena. Then, with an “all right Spokane, you wanted the best!” the curtain fell away to the opening notes of “Detroit Rock City,” revealing Stanley, Simmons and Thayer descending from above on three suspended, octagonal platforms and Singer upstage on a dais backed by a half pyramid out of which lasers, sparks and fire streams flew. Lights ricocheted off of Thayer’s “spacesuit” at angles and up into the rafters while Stanley’s eye-catching guitar, rhinestoned for the gods, sparkled continuously. The pyrotechnics were immediate, extreme and expertly timed, seamlessly creating a percussive extension of Singer’s drum kit. “KISS doesn’t know how to fade away; we need to go away and explode, so this is going to be a supernova,” Stanley had explained just before the tour in a BUILD Series interview. Start to finish, the much too recently inducted Rock & Roll Hall of Famers proved they could still command a crowd and bang out their bar-setting show of shows. “The Rock & Roll Hall of Fame hates KISS. But they had to listen to you!” Stanley shouted over cheers and applause. The crowd enthusiastically sang along through the next few songs, but emphatically lost it when Simmons breathed fire at the end of “War Machine.” In true Simmons style, the legendary tongue made many appearances. The odd choice to show his initial blood-spitting routine in what appeared to be black and white on the big screens made him look more like one of the Uruk-hai from “The Lord of the Rings” than the Demon from KISS. But that momentary tonal strangeness was quickly forgotten as the other band members returned to center stage for a few more classics. The wide-ranging setlist, which featured works from every era of KISS, was well reflected by the multigenerational audience. Many in the audience had seen KISS perform several times, some only once, and many were seeing them live for the first time. They bowed as a group and left the stage, but the audience wasn’t done with them yet. The Arena filled with cheers and stomping feet in the stands as a thousand little cellphone “flames” overcame the darkness. Lights up on stage revealed Singer seated at a star-studded piano, rising from beneath in a magenta haze playing the intro of “Beth.” Then, as he finished the ballad, the others returned to perform “Do You Love Me” and finally, the rightful KISS closer, “Rock and Roll All Nite.” Confetti cannons fired, streamers fell from the ceiling and smoke rolled off the stage into the crowd. The final fireworks blazed, the band took their bows, the crowd shouted out their love and KISS said goodnight to Spokane for the last time. Published: Feb. 5, 2019, 1:15 p.m. Updated: Feb. 5, 2019, 5:23 p.m.